With the average online shopping cart abandonment rate at 68.81%, it’s no wonder eCommerce owners are constantly looking for ways to improve these numbers. The key to decreasing your cart abandonment rate is to combine both cart abandonment tools with analytics plugins. This way, you understand where your customers come from, and you see what design elements, products or marketing techniques are driving them away from making a purchase. Seeing as how you can choose from hundreds of eCommerce platforms, it’s tough to find tools that are compatible with everything from WooCommerce to Shopify. Therefore, we compiled a list of the most useful cart abandonment plugins, and analyzed which of them are the most compatible and affordable. 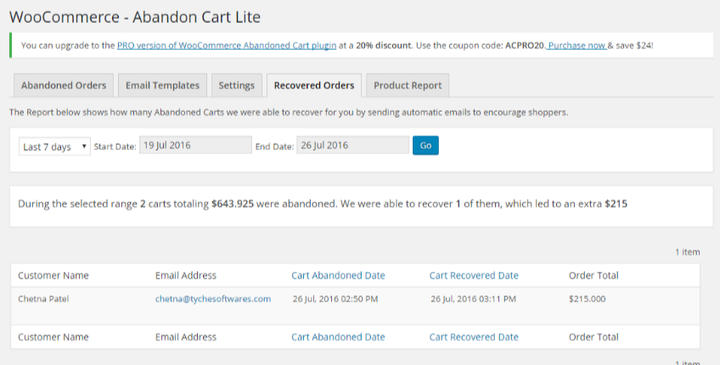 The WooCommerce Recover Abandoned Cart plugin serves as a way to automatically configure and send out abandoned cart emails to get users to come back to your store. The tool integrates with every WooCommerce theme on the market, and you get some nifty features like translations and coupon codes. Include coupon codes to encourage users to return. Put a cart link in the automated emails. It works with simple and variable products. Capture user phone number for more followups. It has a manual email send feature. It only works with WooCommerce. You may have trouble if the theme isn’t built for WooCommerce. As another tool for WooCommerce, the Abandoned Cart Lite for WooCommerce plugin is completely free. We like it for those trying to test whether this functionality is best for them. After that, we tend to recommend upgrading to the paid version (below). It logs carts and sends out emails after a user punches in their email address and abandons their cart. 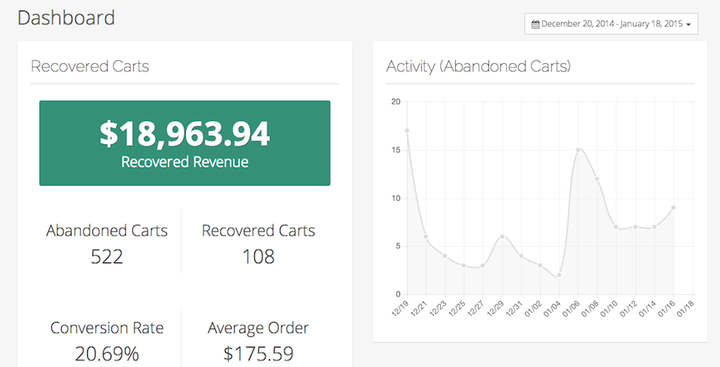 See all abandoned carts and recovered orders in the admin area. Each product is broken down in a report to see if maybe some of them have problems with items like reviews, product descriptions or pictures. You can create your own email templates with simple HTML. Email notifications are stopped once the customer makes a purchase. You receive far more features with the pro version. For example, sending out an email every day is not possible with the free version. The templates are limited with the free version. You’ll have to look elsewhere (or to the Pro version) for adding custom variables. The plugin only works with WooCommerce. This is the more advanced version of the plugin we talked about above. It does seem a bit pricey at first, but most stores can make back their money by bringing back two or three customers. The goal with the plugin is to make more sales from the people who left their carts. Similar to the free version, this one captures registered customer information, then sends out emails once abandoned. The main difference comes in the form of customization with those emails. You can track the carts of guest users as well as registered ones. Generate an unlimited number of email templates, and send them at different intervals. 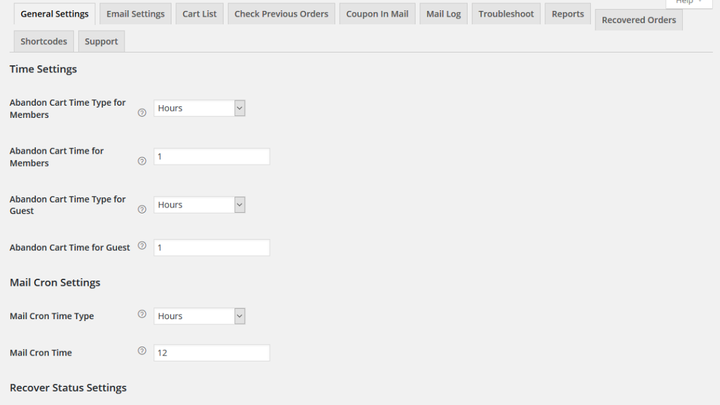 Put WooCommerce coupons in the emails. 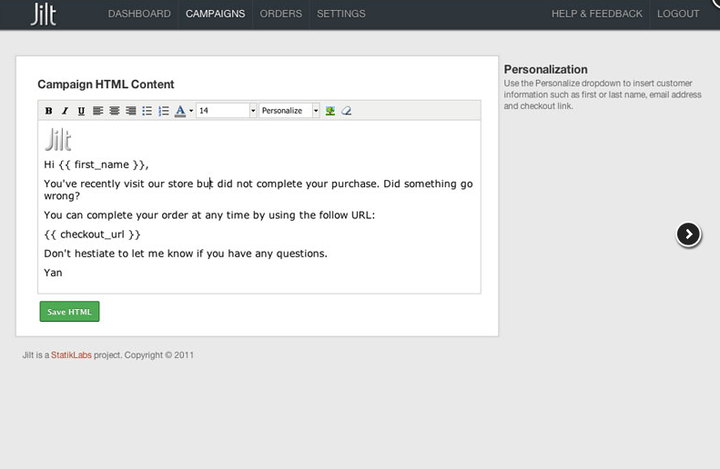 Add custom variables like product information and customer names. Emails are stopped when an order is finally made. Track whether or not expired coupons are causing people to abandon. Some people online think it’s a little too pricey (I don’t necessarily agree with this, though). However, all businesses have varying budgets, so it’s worth mentioning. Easy Digital Downloads (EDD) is an app for selling digital products through a WordPress site. This Sales Recovery tool is an add-on that must be integrated with an EDD site. The main feature is an automated messaging system for when users leave a cart without buying. Users opt out of the recovery phase by hitting an Unsubscribe link or when buying a product. A unique, one-time discount code is generated for each of the recovery emails sent out. 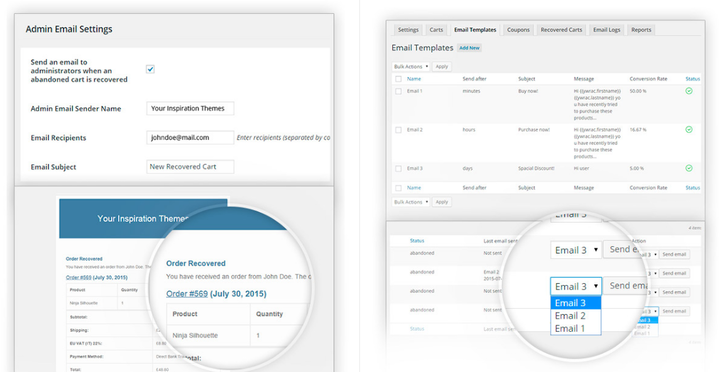 Template tags are provided for the ultimate customization of the emails. Looks for failed, abandoned and pending transactions, instead of only abandoned carts. See every recovery attempt in your WordPress dashboard. The EDD tool is a little more complex compared to the other options on this list. You’re forced to use EDD, even if you already have an eCommerce store with a tool like WooCommerce or iThemes Exchange. The templates can be highly customized, but less experienced users will find that their email templates look boring and plain. Any WordPress site with Easy Digital Downloads installed. AbandonAid is one of our favorites, mainly because you can pretty much integrate it with just about any eCommerce platform. Furthermore, the abandoned cart app has a solid pricing strategy that only charges you if they recover revenue for you. You don’t have to spend a dime unless the app actually works for you. Along with apps for platforms like Shopify, AbandonAid runs on an incredible number of other systems. Exit popups are provided to try and grab users who are trying to leave your website. A/B testing is provided to see why people might be exiting your site. 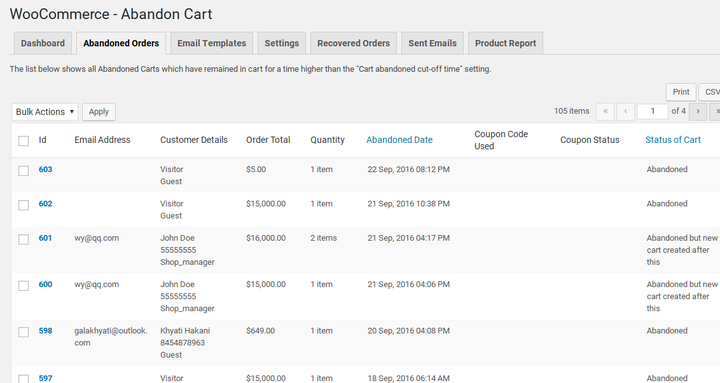 Automatically show the items users left behind in the emails sent out for abandoned carts. Some code implementation is required for most platforms. Yes, Receiptful has features for handling abandoned carts. But it also offers a few other handy tools. For example, you can use the small suite to send out automated receipts after purchases. In addition, Receiptful lets you send out follow up messages to those who actually made purchases. So, if you’d like to send out a thank you or an email to see how everything is going, that’s entirely possible. It’s more than just an abandoned cart plugin. The email customizer is one of the best we’ve seen, allowing for solid branding. Drop coupons in the emails. Include a Return to Cart button. Show all of the items they left in their cart. Treat every customer category different. The abandoned cart functionality is only available in the premium version. The free plan has Receiptful branding on the emails. Installation requires a code transfer. CartStack is yet another tool for sending out automated abandoned cart emails, yet it’s more of a full suite with a multitude of other features like A/B testing and highly professional email design. The pricing isn’t exactly the lowest, but you get what you pay for. The emails are set automatically, and you never have to go back and change them. A custom email template is given to you for free. This means they develop the template based on your current branding. AKA your template is going to be better than what you would find anywhere else. A/B testing is included. The email builder is visual. Inject cart products into the emails. May seem somewhat intimidating for beginners. Just about any website or online shop platform. The pricing for Jilt hurts it quite a bit, but that’s no reason to not look into the plugin. Overall, it has a solid tracking system, and it has a really nice feature for recovering revenue from multiple shops. You only have to pay the one monthly fee if you’re utilizing the app on multiple shops. This is the main reason I would recommend it to anyone. Send an unlimited number of campaigns for every abandoned order. Personalize emails with names and emails. In their defense, the Jilt company only has one pricing plan, making it simple. The pricing strategy is bogus. High volume vendors get stuck with a bad percentage, while low volume vendors have to pay a high monthly fee. The email templates are pretty darn basic. I would expect a full suite of abandonment products for the price. MoonMail is limited to Shopify, but anyone who has used Shopify knows that the app installation process moves fast. It’s a highly rated app in the community, and it’s one of the more affordable, and basic, abandoned cart email tools in the app store. You get five email templates. One of the primary plans is free. Gain full control over when the emails go out. Send different templates for different countries. Show products and other elements with tags. The editor is a little basic. You have to go with a paid plan to edit email frequency. Consider YITH if you’re currently running (or planning on making) a WooCommerce store. What’s interesting is that if you join the YITH club ($25 per month) you get access to all of the eCommerce plugins made by the company. Although it looks like a high price, you should recoup your costs quickly. Plus, it’s better than paying a monthly fee. A watered down free version is provided for you to test it out. Evaluate all abandoned carts and automatically send out emails to these users. Show customer and cart information. Non-registered users can recover their carts. I can’t imagine ever using the free version for a serious site. The email templates are nothing to write home about. You can only use YITH with WooCommerce. Which Abandoned Cart Plugin is Best for Your Store? If you’re going with Shopify, I have a hard time recommending anything other than MoonMail. It’s simple and you get a free plan. Digital sales sites should opt for EDD Sales Recovery, while WooCommerce works nicely with the Abandoned Cart Pro plugin. As for tools that run on most website platforms, I recommend AbandonAid and Receiptful. If you have any questions about abandoned cart tools and plugins, drop a line in the comments below.